Angela Thirkell was hugely successful in the ’30s, ’40s and ’50s but rather dropped out of sight in later years. However, she maintained a stalwart readership who pursued her out-of-print titles vigorously. Although aware of AT, I’d never read any of her work until Virago added her to their list of neglected women writers and reissued some of her best known novels. High Rising is perhaps the best known, and is the first of the long series set in the fictional county of Barsetshire (helpfully created orginally by Trollope). It concerns the conflict caused by Una Grey, the new secretary of George Knox, famed writer of historical biographies, and who has her conniving mind set on becoming the next Mrs Knox. However, George’s friends step in, led by his neighbour, novelist Laura Morland, and rout the Incubus. Laura also manages to engineer the engagement of her literary agent Adrian and Sibyl among others. I loved the self-deprecating, hairpin-dropping, capable but slightly scatty Laura, mother of the deeply irritating Tony and terribly successful writer of ‘good bad novels’, the forerunners to today’s often unfairly derided chick-lit novels. 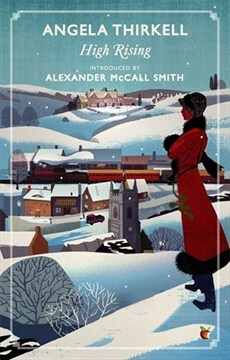 Do try High Rising if you can – it’s the perfect companion for a Sunday afternoon with tea and buttered crumpets and comes with an introduction by Thirkell fan Alexander McCall Smith. This entry was posted in Reading, Shelf Notes and tagged Angela Thirkell, review. Bookmark the permalink.